It's not easy to connect with leads on the phone. The marketing team might provide you with leads, but when you call to qualify them, you miss them. Lead revisit alerts make connecting with leads easier. When one of your leads comes back to your site, HubSpot will notify you so you can take action and call those leads. Please note: you must be a user in a Marketing Hub Professional or Enterprise account to receive lead revisit notifications. You do not need marketing access enabled for your user, but there must be a Marketing Hub Professional or Enterprise subscription in your account. With the lead revisit feature, you can receive an email in your inbox and an alert in your notification center when an existing contact visits your website. The notifications include a link to the contact's profile page, where you can see a full history of interactions that person has had with your company. If you have assigned a lead to a specific sales rep within Salesforce, that rep will receive the revisit alert when that particular lead visits the site again. Contacts visiting your site for the first time. Contacts for whom you've received a lead revisit notification in the past 24 hours. Contacts that you do not own (if applicable). Contacts revisiting your site with a lifecycle stage of Customer. Notifications will still be sent for contacts with all other lifecycle stages, including Evangelist and Other. The email notification you receive will list your lead's information and the domain that they've visited. Please note: if the specific page they visited has a unique canonical URL that has a different domain than the domain in its visible URL, the domain in the canonical URL will be displayed in the email instead. Click to toggle the Lead revisit notifications switch on. No leads: select this option to turn revisit notifications off for your user account. 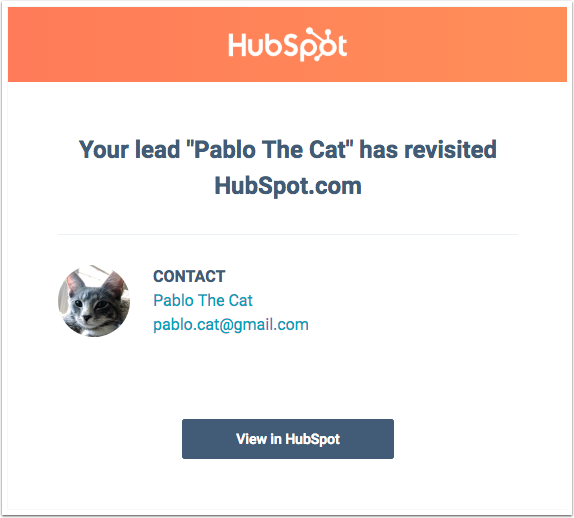 Please note: if you are not a HubSpot user and no longer want to receive lead revisit notifications, open an old lead revisit notification email and click the unsubscribe link at the bottom of the message. If you are a lead owner in Salesforce, you will need to unsubscribe after you receive your first email. There is no option to unsubscribe before the first email is received. All leads: select this option to send yourself lead revisit alert notifications for every contact in your contacts database. 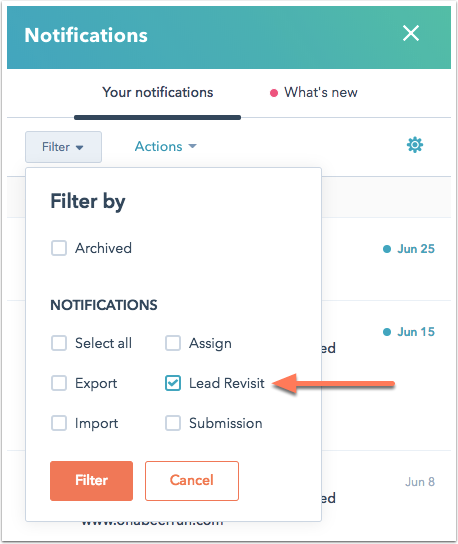 Leads that you own: select this option to send yourself lead revisit alert notifications only for the leads that are assigned to you. Please note: each individual user must set their own lead revisit notification preferences. An admin or other user cannot adjust their team member's preferences. In your HubSpot account, click the notifications icon notification in the main navigation bar. To filter your lead revisit notifications, click the Filter dropdown menu. Select the Lead Revisit checkbox only, then click Filter. In the Alerts section, clear the Daily email checkbox if you no longer want to receive an email summary of the companies that visited your site. Clear the Notifications checkbox to disable the instant revisit notifications. 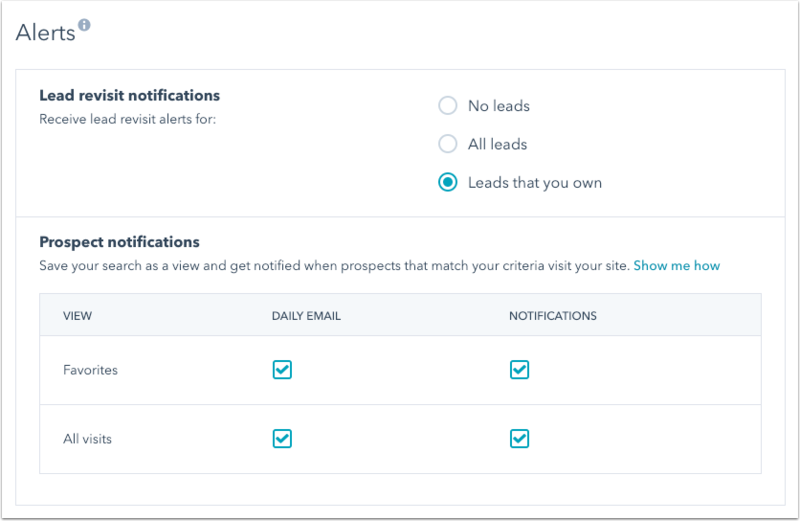 If your HubSpot account is integrated with Salesforce, lead revisit alerts will be delivered to the sales rep assigned to the lead in your Salesforce account. 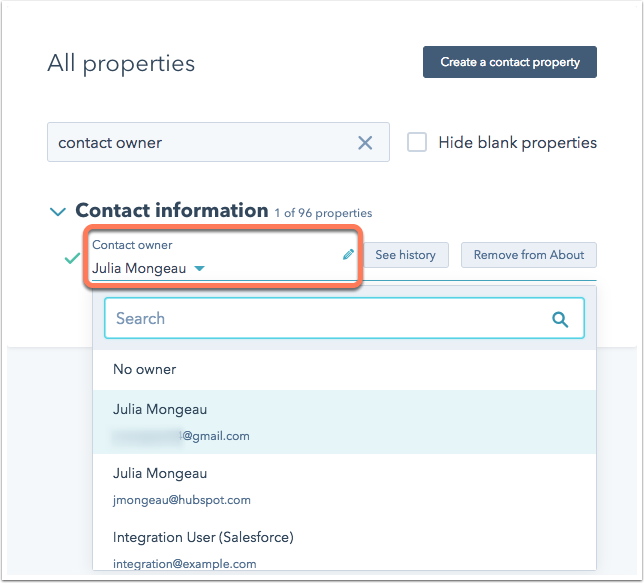 If you are not integrated with Salesforce, you can use the default property, Contact owner, to automatically trigger lead revisit notifications for your users. This property will pull the owner name and email address from the users currently associated with your account. Click the name of your unassigned contact. In the About card on the left side of the contact record, click View all properties. Use the search bar to find the contact owner property. Hover over the owner property and click the pencil edit icon, then select an owner from the dropdown menu. To assign owners to multiple contacts at a time, use a workflow or bulk edit the records from the contacts dashboard. To set up owner assignment rules for future contacts, you can also use a workflow.